Two weeks ago, I returned to Dr. Geller, the orthopedic podiatrist who’s been treating my most-recent stress fracture. He x-rayed the site of the injury, and gave me the green light – healed! 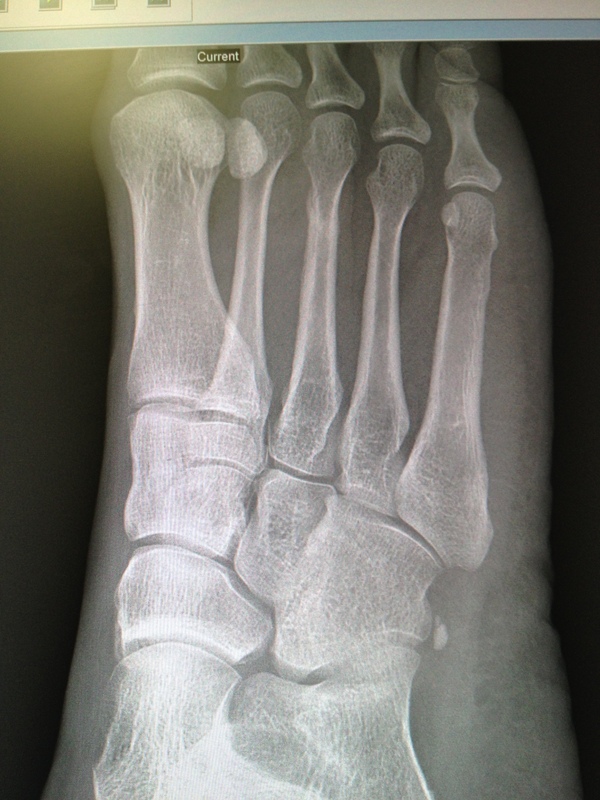 You can see it in the middle metatarsal: a faint, swirly milky way of new bone. I can finally put seven weeks of recovery behind me. Now, it’s time for next steps. Since this stress fracture is a repeat injury – second instance on same foot, different metatarsal – Dr. Geller has me undergoing a number of evaluations to determine the cause(s). Between a DEXA bone scan to determine bone mineral density, blood work, and a gait evaluation with a physical therapist – some answers are to be had. With each piece of the puzzle comes a better understanding of why I came away injured during the Chicago Marathon. Since the tests are still ongoing, I’ll wait to put all the information together. I realize my experience is not uncommon. Hopefully the information I share at some point will be useful to someone in the same situation. In the meantime, I’m undergoing physical therapy at Finish Line PT to help retrain and strengthen the supporting muscles – especially in my right foot/leg. Initially I felt discouraged to find myself sidelined a second time. Eventually, I accepted the repeat injury as a cry from my body that something needed to be addressed now. As I begin to understand the larger picture around this small stress fracture, I see that this is a valuable learning experience. Hopefully all the information and therapy will become the foundation for a faster, stronger spring season…and running career, in general. Thanks! I thought so too about the pic! Really fascinating to see exactly how the body heals.